Italy is a surprisingly rich country that manages to combine an incredible number of highlights, outstanding gastronomic traditions, turbulent cultural life as well as an amazing coastline washed by five seas. Just imagine gentle sun, warm sand, turquoise sea, and light breeze… and generally, such description suits almost every seaside Italian town! 7500 km of the Italian coastline contains plenty of places with both noisy lively beaches and cozy rocky lagoons, hidden from the flow of tourists. So what are the most famous Italian beaches any traveler should head to? If your choice fell on visiting the northern regions of Italy, you’ll definitely be pleased by the nice options that this part of Italy has in store. One of the largest and most popular resort towns of the Adriatic coast is Rimini. This lovely destination can meet the demands of everyone dreaming of a leisurely beach holiday with the Italian spirit. The main attraction of Rimini is 15 kilometers of 150 unspoiled beaches, washed by the calm waters of the Adriatic Sea. Moreover, Rimini beaches have an excellent infrastructure with showers, toilets, playgrounds, cafes, and bars. This coast is ideal for travelers who prefer hanging out at parties and beaches with festive atmospheres like Rivazzura and Marabello as well as for families searching for a solitary relaxing holiday on such beaches as Belleriva. San Remo is the fourth largest city in Liguria, from which you can easily reach the French Riviera. Here posh hotels adjoin more democratic accommodations, but in general, beach holidays in Liguria are slightly more expensive than ones on the Adriatic coast. San Remo boasts cozy beaches which vary from sandy to pebbly and stony ones. Those who do not really like pebbles or travel with children should choose Tre Ponti, a sandy beach with a soft dip into the sea. Of course, this makes the place very popular among locals and travelers, so it becomes quite busy at the peak season. One more outstanding corner of Italy is charming Cinque Terre. The rugged coasts of the Italian Riviera mesmerize lots of travelers from all over the world. The largest sandy Cinque Terre beach is located in Monterosso, others have only stones. However, the distinctive feature of the coast is that there are almost no winds, which makes them perfect for swimming and sunbathing. The capital of the resort zone of Versilia, Viareggio, is located on the Tuscan coast of the Ligurian Sea. The surroundings of the city are simply incredible: blue-blue sea, pine forest, and palm trees. Beaches in Viareggio are sandy and long which makes the city the most popular resort of Tuscany. What is more, Viareggio beaches are awarded the "Blue Flag" which means that the coast is guaranteed to be clean and complies with the highest European standards. If you want to spend a holiday near the capital of Italy, Rome, you can consider visiting beaches in such neighboring resorts as Santa Severa, Anzio, Montalto Di Castro and the Isle of Ponza. Southern Italy, in its turn, doesn’t fall behind the north in terms of attraction of its beach resorts. One of the most recognizable coats of the south and whole Italy is the gorgeous Amalfi Coast. Strive to visit most picturesque colorful towns and villages grown on the rocks and surrounded by lemon and orange groves and to spend unforgettable beach holiday? Head to the widest and longest beach on the entire Amalfi, Maiori, covered with volcanic sand or to the beach of Marmorata at the foot of Ravello. The seaside town of Vieste is the pride of Puglia, which boasts amazing beaches. Once being a typical fishing community in southeast Italy, modern Vieste turned into a popular resort with the cleanest beaches that have been repeatedly awarded the "Blue Flag". One of the main beaches of the city is Spiaggia della Scialara. Apart from clean water and infrastructure, the beach offers incredible views over the castle. In general, Puglia began to attract tourists not long ago, so the potential of its coast has not yet been fully revealed. If you move south of the Puglia region, to the “heel” of the Italian “boot”, you can also visit such lovely beaches as Dune di Campomarino beach in Campomarino, Torre Lapillo Bay in Porto Cesareo and Pescoluse in Leuca. 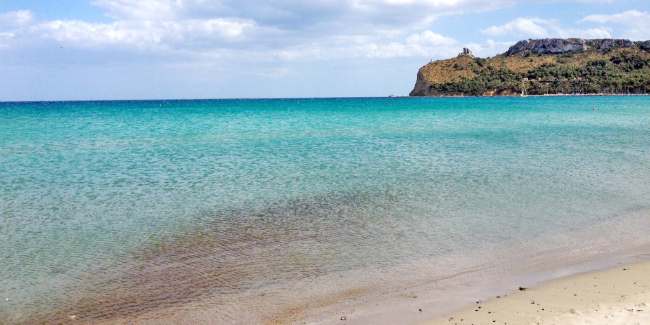 Talking about beaches of Southern Italy, we can’t miss amazing spots on the Isle of Sicily. This fabulous island is created so that a person could learn what a real holiday means. The most exotic beaches of Sicily are the black ones as they formed due to the proximity of the famous volcano Etna. If you want to luxuriate on a snow-white warm sand, you can choose among such places as the beach of San Vito Lo Capo, accessible from Palermo or to the beaches of Catania, Tindari, Taormina, and Syracuse. Another Italian beach paradise is Sardinia. Cala Luna in Orosei, La Pelosi in Stintino, La Cinta in San Teodoro are just the beginning of the endless list of beaches worth visiting in Sardinia. However, a true gem of the isle is Spiaggia Rosa or the Pink beach. This natural wonder was almost destroyed due to human activities but since 2006, it is possible to get to this coast on a boat and to enjoy this beautiful miracle!